Contrary to popular belief, it takes more water to hand-wash dishes than it takes to wash them in the dishwasher. Scrape food from plates, and let your dishwasher do the rest. It screws onto the bottom of your faucet to reduce water flow, without reducing water pressure. You can even get some that swivel to allow you to direct the water where you need it. Note: If you have a newer faucet, it may already have one built-in. Then, you won't waste water while you wait for the tap to get hot. If you regularly need hot water for pots, dishwashing, and hot drinks, consider installing a point-of-use hot water heater (also known as an instant hot water system) under the kitchen sink. It’ll supply you with hot water as soon as you turn on the tap, and only costs a couple hundred dollars. Low-flow showerheads use 2.5 gallons per minute (gpm); older models use as much as 5.5 gpm. Make the switch and you'll reduce your water bill by 25-60% (US Department of Energy). Aim for a five-minute shower. With a low-flow showerhead, you'll use 12.5 gallons of water or less. Compare that to 37.5 gallons for a 15-minute shower, and the savings is pretty easy to see. A leaky faucet can waste 1000-2000 gallons of water a year (National Sanitation Foundation). Less flow time equals less water used. According to the National Sanitation Foundation, a leaky toilet can waste as much as 500 gallons of water each day! Place a dye tablet (free at home improvement stores) in the toilet tank, and watch to see if the dye seeps into the bowl. If it does, you have a leak that needs to be addressed. Toilet flappers break down quickly and should be replaced once a year – even if they say they're good for longer. A couple dollars spent on a replacement flapper will save you much more on your water bill. Several manufacturers now offer flappers that you can adjust to your desired flush volume. According to Niagara Conservation, an adjustable flapper can save up to three gallons per flush. Save another 1/2 gallon per flush by installing a fill cycle diverter in each of your toilets. This simple add-on costs less than a dollar and is designed to divert overflow water back to the tank during the fill cycle. Fill a bottle with water, and place it in the toilet tank. It'll displace water, and cause the tank to fill with less water. Just how much water will this save? An amount equal to the size of the bottle that you placed in the tank. A 20 oz. bottle, for example, will save 20 oz. of water per flush. When it's time to replace your toilet, replace it with a low-flow model that uses 1.6 gallons per flush, compared to a traditional toilet, which uses 3.6 gallons. You’ll save water and wear and tear on your machine. Pants and outwear usually don't get very dirty. Wear them twice before washing, and you'll cut down on your water use and your housework. Now that's hard to argue with! A high-efficiency washer can be as much as three times as efficient as a regular washer. (US Department of Energy). Upgrade when your current washer dies, and enjoy the savings. Save your cooking water, unused drinking water, and the water that comes out of your shower while you're waiting for it to warm up. Then, use it to water your plants. The shorter the distance the water has to travel, the faster you'll have hot water. This relatively inexpensive system (just a couple hundred dollars) uses a pump to pull hot water from the hot water heater faster, and returns cool water from the pipes to the water heater for reheating. When it's time to replace your hot water heater, consider upgrading to a tankless unit (also known as an on-demand water heater). 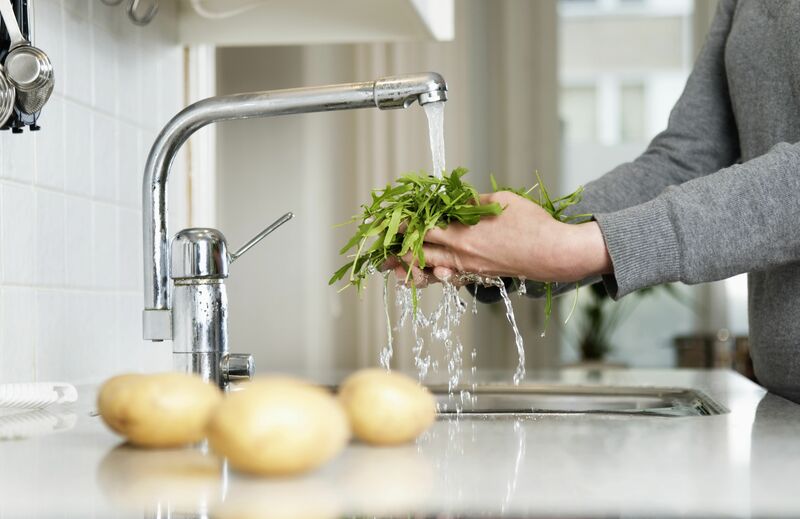 It heats water faster and only when you need it – a water savings and an energy savings. Attach rain barrels to the end of your gutter drain spouts to collect rainwater. Then, use it to water your plants and wash your car. Use a soaker hose to water the plants in your yard, and you'll have precise control of where the water goes – and more importantly – where it doesn't. Fill a wading pool for your kids, instead of letting them play in the sprinkler. They can splash around for hours without the continuous flow of water. Then, let the rain handle all of the watering. Mulch reduces evaporation, ensuring that your plants get the full benefit of rainwater and your waterings. A little sweeping action can save a lot of water – as much as 80 gallons a year, according to wateruseitwisely.com, and it's good exercise. Eartheasy.com, says it takes up to 100 gallons of water to wash a car. The Environmental Protection Agency says it can take over 500 gallons. Either way, that's a lot of water to devote to car washing. You'll eliminate 100 gallons (or more) of water from your water bill each time you take your car to a car wash, and if you choose a facility that recycles water, you'll be helping the environment, too.